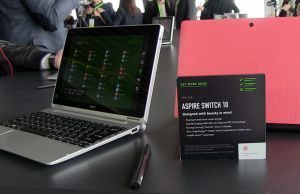 The Switch is Acer’s most popular line of 2-in-1 ultraportables right now, with devices like the Switch 10 and the Switch 12 launched in the last year. 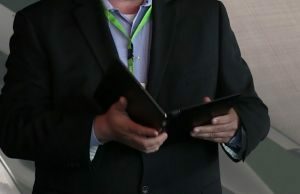 2015 brings up a few novelties in the series: a redesigned Switch 10, a new and more affordable Switch 10 E and a premium-built /Intel Core M powered Switch 11 V. They do have one thing in common: they are all detachables, or in other words stand alone Windows tablets with matching docks. 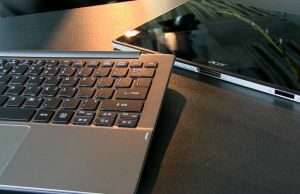 I got to spend some time with them and this post gathers my early impressions on these 2015 Acer Switch convertibles. 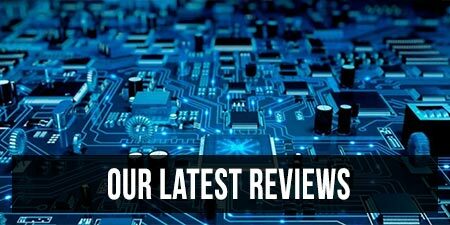 Have a look and stay close for the updates and the reviews to come. We’re going to start with the star of this new lineup, the Switch 11 V.
As the name suggests, it bundles an 11.6 inch touchscreen with an IPS panel, which will translate in accurate colors and proper viewing angles. Reflections should be also kept at bay with the Zero Gap technology, which minimizes the space between the actual display and the glass on top, but we’re still dealing with a glossy screen here nonetheless, with its associated inconveniences. 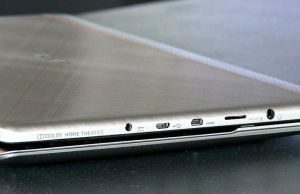 That aside, the Switch 11 is sleek and beautiful. 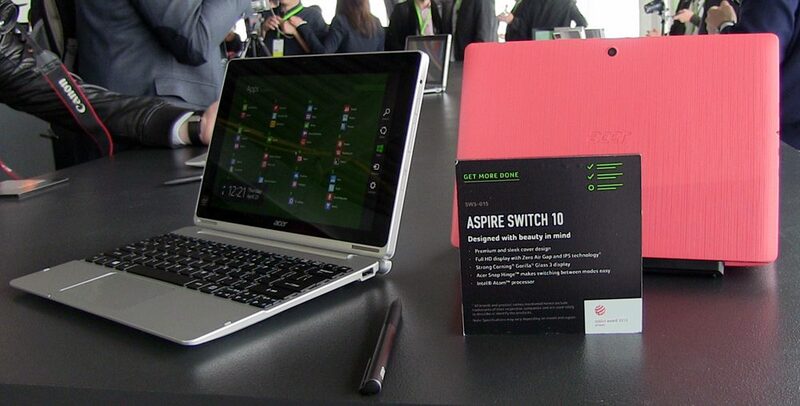 The truth is this is not Acer’s first Switch 11, but it’s a complete redesign from last year’s model. The 2015 version has a more reduced footprint, feels and looks better thanks to its sturdy aluminum build and also bundles a more compact dock. All these make the Aspire Switch 11 V a more portable device. 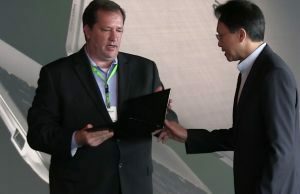 Acer also worked on making the transition between tablet and laptop mode as seamless as possible, by tweaking the latching/unlatching mechanism and designing a new connector that ties the tablet with the dock. The results are really good, both on this Switch 11 series, but also on the new 10s. The dock houses a fairly good keyboard, at least based on the few minutes I got to use it, as well as a full-size USB slot and a Microsoft Precision Trackpad. It’s light, but the entire combo is only top heavy when you lean the screen back as much as possible. I can’t tell for sure if a 2.5″ storage bay is going to be available inside the dock, but that would be a nice addition. The bigger novelty here though is the Core M hardware inside that replaces the Atom and Haswell Core Y hardware which powered the previous models. Personally, I’m not a huge fan of Core M, although I’ve seen it’s true potential on some devices. It does have the major benefit of being a fanless platform, but imo doesn’t exactly deliver on performance, temperatures and battery life. 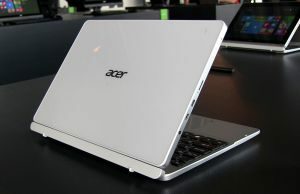 Still, there are better and worse Core M implementations out there, and hopefully Acer’s will be a success. BTW, I’ve made a complete list of fanless ultraportables, if you’re interested. 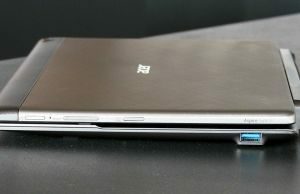 Overall the Aspire Switch 11 V is marketed towards professionals searching for a nice looking, proper built and decently fast computer that could be easily lugged around everyday. 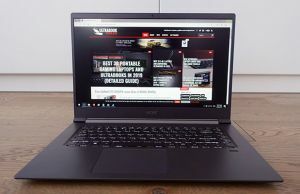 It will compete with the Acer Transformer Book Chi T300, which offers a slightly bigger screen in a sleeker overall body, but it’s also pricier and packs a smaller battery. 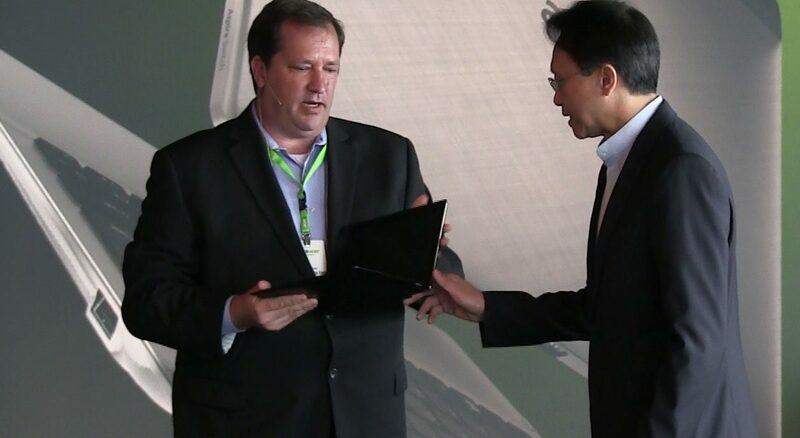 BTW, Acer announced a 45W battery will be tuck inside the Switch 11 V and if that turns out to be true, it will translate in great autonomy, given how most other similar slates only offer around 30ish Wh batteries. The Switch 11 V will be available later this year, starting at around $500. 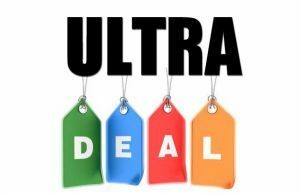 That would make it one of the most affordable Core M devices out there and could attract many potential buyers, although there are still plenty of questions that need to be answered before we actually get to draw any final conclusions. Stay tuned, that’s going to happen in the months to come. 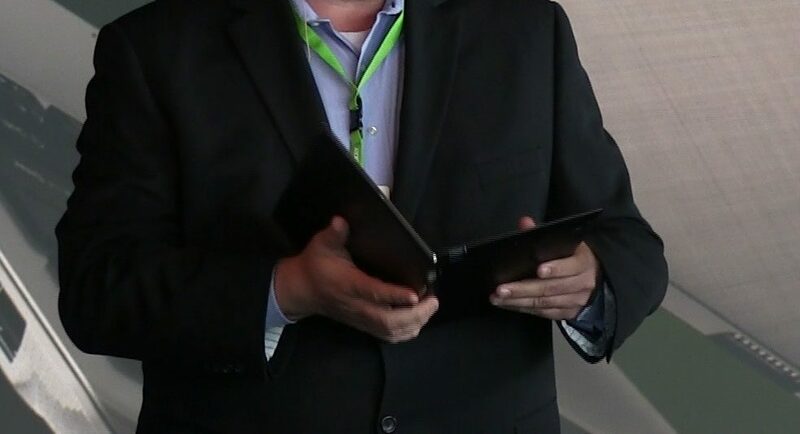 A quick reference to this soon to be launched Acer Switch 12 2015 was made during the press-release this week, but other from the fact that it’s going to be a very thin 2-in-1 detachable powered by Core M hardware, there’s very little to say about it at the time of this post. I do have a few pictures, but they were cut out from a video and I have to apologize for the quality and blurriness. 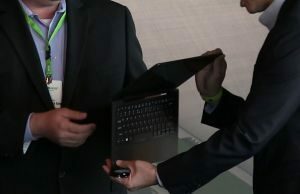 There’s also a video from Notebookitalia showing a bit more about this device. 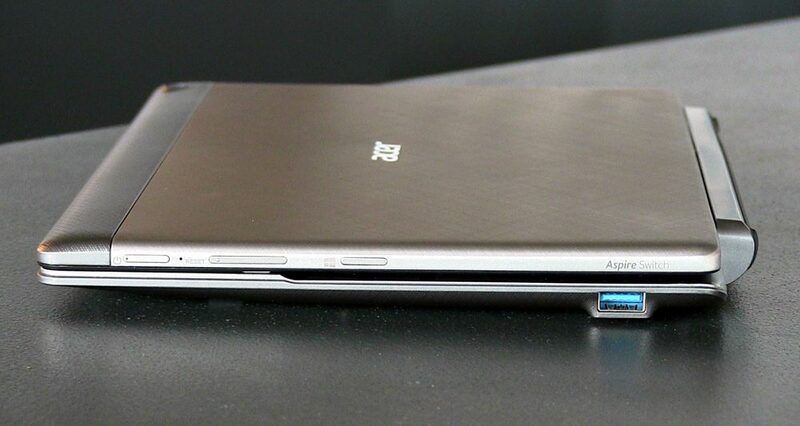 The 2015 Switch 10 (model number SW5-015) is a refresh of last year’s Switch 10, still built on Intel Atom Z series platforms, but slightly redesigned. It has now received a Gorilla Glass covered back (like on the Aspire S7), among other things. 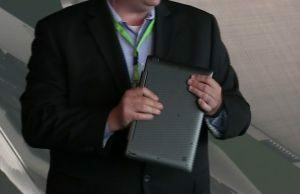 Overall the Switch 10 feels like a sturdy built slate and it is slightly sleeker and lighter than last year’s model, with its 10 mm waist and overall weight just shy of 600 grams (1.2 kilos for the tablet + dock). The ensemble is still top-heavy though and will fall on its back when leaning the screen past 100-110 degrees, which I found annoying. Many 2014 Switch 10 buyers have complained about this issue on the previous model, that’s why I’m surprised Acer did not address it on the new version. In fact, that’s also a nuisance on the Switch 10 E as well. The dock offers an USB slot, can take a HDD inside in case you’ll need more storage space and houses a shrunk-down keyboard and petite trackpad, as you’d expect from a mini computer of this size. These aside, you should also know you’ll be getting a nice 10.1 inch IPS FHD display on this device with digitizer support, as well as around 5-6 hours of daily use on a charge (from a 22 Wh battery). 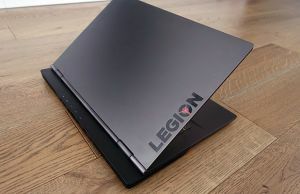 The base configuration will include the Intel Atom Z3735 processor, 2 GB of RAM and 32 GB of storage (64 GB models will also be available), paired with a 32-bit version of Windows 8.1. Acer actually claim this new Switch will hit 7 hours of use, but I frankly doubt that’s going to be possible, given the small battery and the FHD screen. Time will tell. 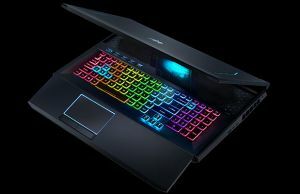 Anyway, all these sound just about right, but I do think Acer should try to bring this thing in stores sooner if possible. 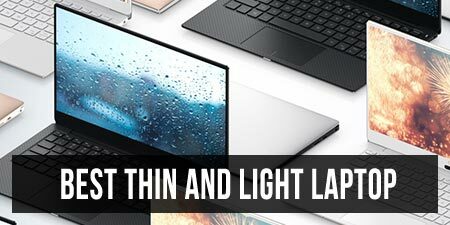 They are aiming for the back to school season in the US and this is well suited for students, but the competition already offers similar devices, like the recently launched Microsoft Surface 3 or the Acer Transformer Book Chi T100. 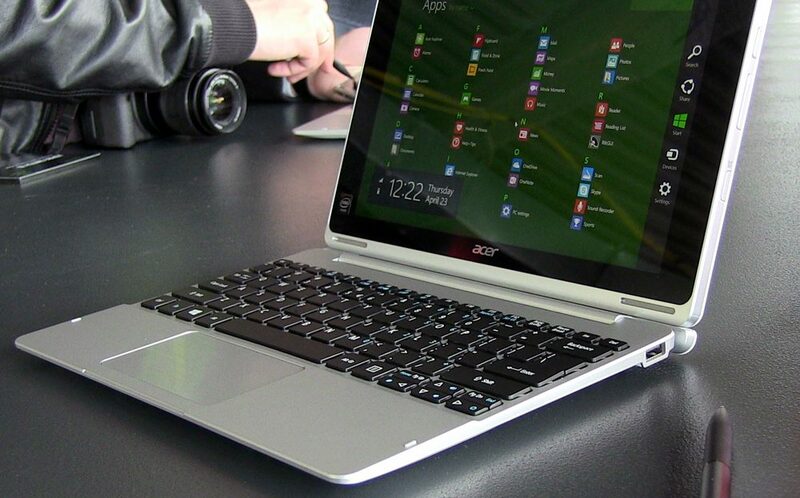 This is Acer’s most affordable 2-in-1 detachable and it’s expected to ship later this year (in July) for $279 and up. That’s a real bargain, but the screen and aesthetics had to be somewhat sacrificed in order to reach this kind of pricing. 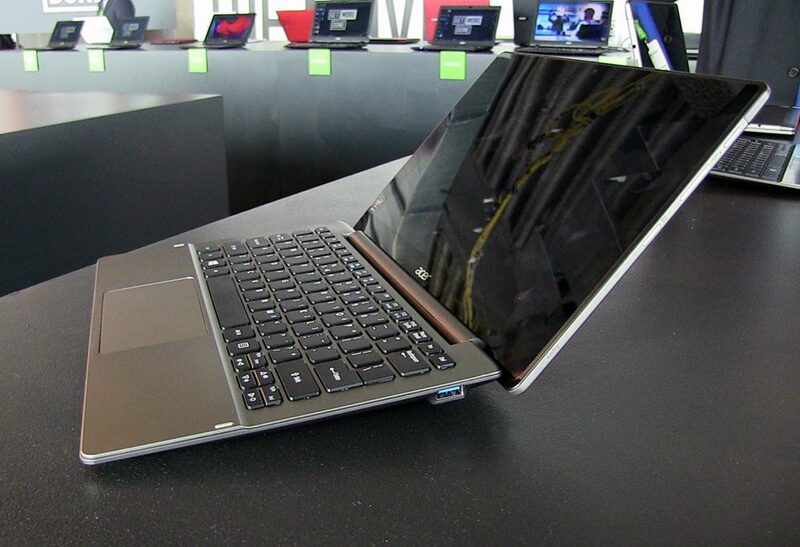 The Switch 10 E is a 10 incher, like the Switch 10, and it’s still built on Intel BaiTrail Atom hardware. 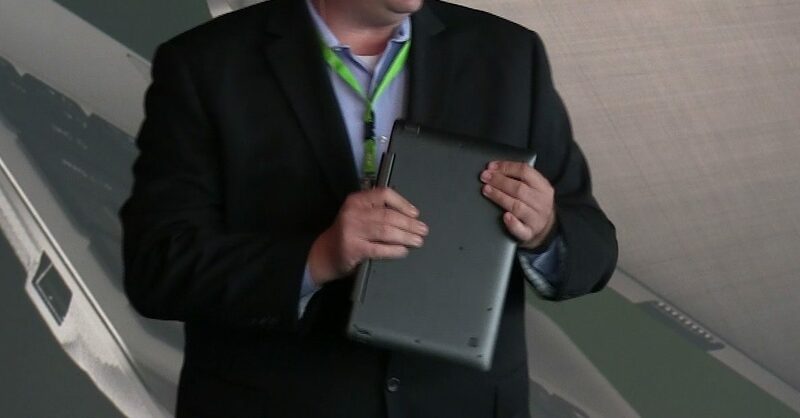 However, it only packs a 10.1 inch 1280 x 800 px touchscreen and what looks like a TN panel. A rather dim one, which combined with the glossy glass surface made this nearly indistinguishable in a bright room. The 10 E is also a slightly bulkier device, made entirely out of plastic, with a textured hood that will be sold in about 6 different colors. This latter aspect is in fact appealing and a stand-out point for the series, as most other devices are not available in blue, pink, purple or magenta (white and black versions are also available). Still, if you look past the weight and the bulk (630 grams and 11 mm waist for the tablet alone, 1.28 kg – 2.82 lbs for the tablet and dock), this thing feels nice and strong enough to handle the daily hassle. One of the reasons behind the slightly larger body is the fact that there’s a 30 Wh battery inside this thing, which combined with the Intel Atom BayTrail hardware and the HD-only display should easily translate in about 10 hours of use on a charge (Acer claims up to 12). The Switch 10 E is bundled with a matching dock that offers an USB slot and the same quick-latching mechanism and connector seen on the other new Acer Switch 2-in-1s, which makes the transition between slate and laptop modes quick and smooth. The ensemble is however top heavy, which could make desk-use annoying, as even gently taping the screen will cause the Switch to fall on its back. 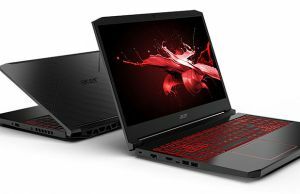 Regardless, the price remains the Switch 10 E’s major selling point and if Acer will actually deliver a product without hidden flaws, I’m confident this will become a best seller in the second part of 2015. There are clearly better 2-in-1s out there, but if you’re on a very tight budget, this one will be worth at least a look. 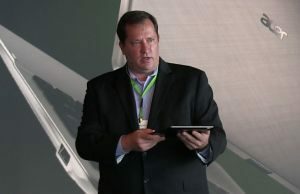 We’re not going to draw the line on any of these new Acer Switch tablets/laptops, despite the fact that the first impressions are fairly good. 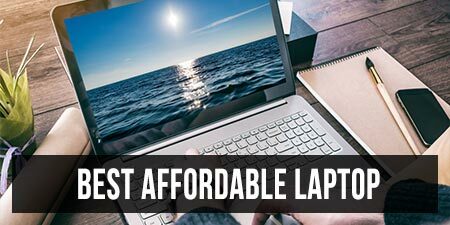 Acer created a diverse range of products aimed at different types of users with different budgets at their disposals, and they kept all the series competitive when it comes to what you’ll be getting for the money. That in fact has been their strategy for a while. Time will tell if these machines play out to be successful or in fact good, but stay close, We’ll be reviewing them properly as soon as they become available and we get out hands on them. 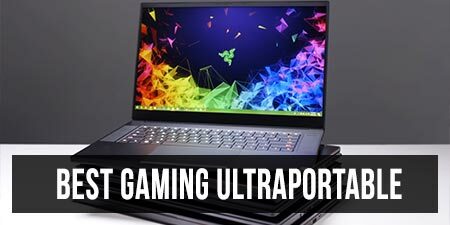 Will the Aspire 11 V really start at $500? That seems like a really great price. I just hope you can put a HDD in it. When will the aspire v11 be out ? Its out this is what I’m using to type this on here.